"Beautiful drapes!!! They are so well made and silk is excellent quality. For custom drapes, they arrived fast. The drapes were packed carefully with each panel being folded and placed in protective plastic. Did not need to even iron them. Love these drapes!!!!" DrapeStyle has been setting the standard for quality and value for premium, USA made custom silk drapes and high end curtains. 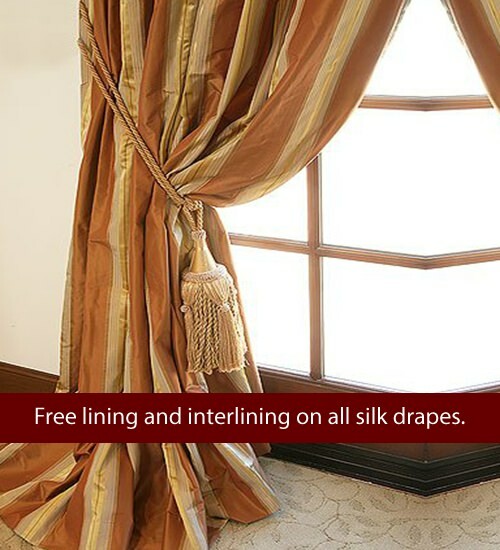 We make each set of custom window treatments using the finest quality Indian fabrics and premium linings, in your choice of length, width, lining and pleat style. Schumacher is one of the oldest and most respected designer mills in America. Their elegant curtain fabrics have been used in some of the finest homes including the White House. Each having an average of 25 years of experience, our talented team of seamstresses are exactly who you need to make your luxury designer curtains or draperies right here in the USA. 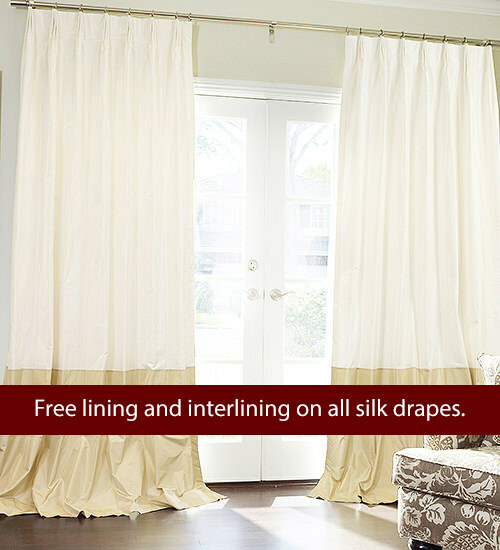 The classic sheer curtain panel that never goes out of style. 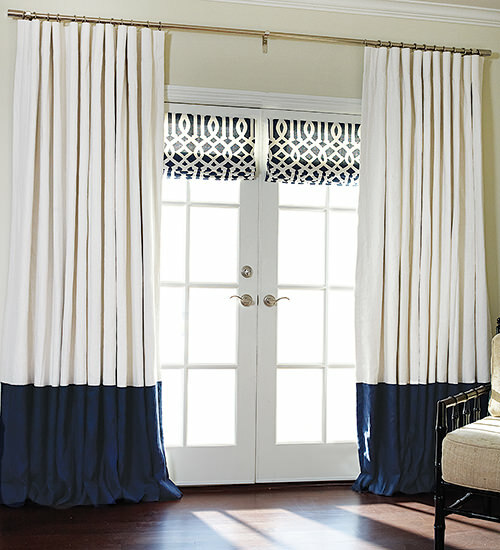 Choose a simple yet elegant flat panel curtain or personalize them by adding an optional top-band or custom pleat style. When you buy your custom drapes from DrapeStyle you are buying "factory direct". 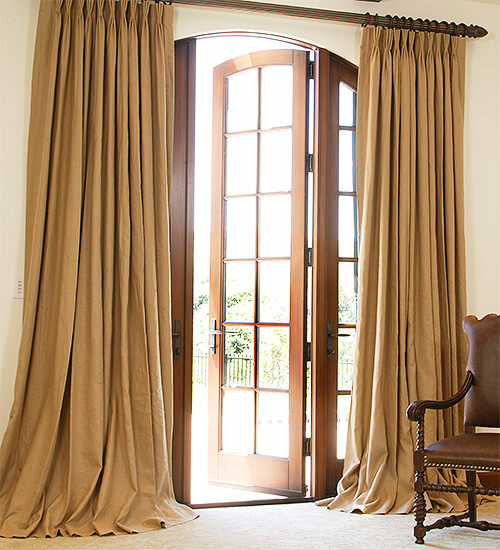 Each luxurious curtain is manufactured in our Arizona based studio. We have the perfect living room drapes and curtains at DrapeStyle, and you can finish your custom window treatments with the details like drapery tie-backs, tassels and trims. If you don't see exactly what you're looking for please don't hesitate to call one of our designers at 800-760-8257. 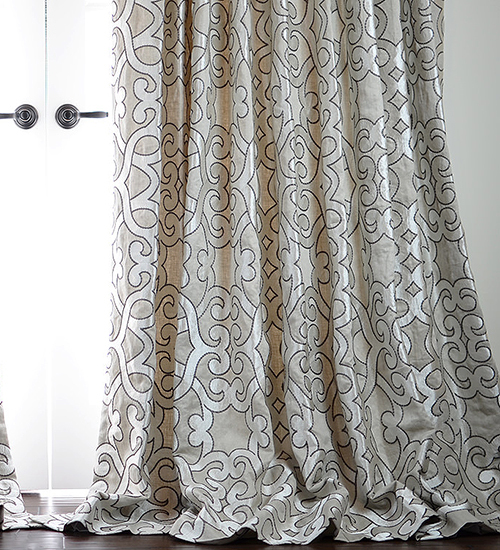 When looking for custom drapes in designer fabrics like Robert Allen, look no further than DrapeStyle. We've been hand-making custom window treatments, including curtains and Roman shades, in Robert Allen fabrics for over 15 years. If you are looking for a particular Robert Allen fabric that you don't see listed, please call one of our designers who will locate it for you. We love to combine fabrics into unique styles especially silks and linens. Since we manufacture all of our drapes, curtains and Roman shades to order, we are capable of making any width or length imaginable. And, if you need a little inspiration or some help measuring your windows, just call one of our talented designers at 800.760.8257. 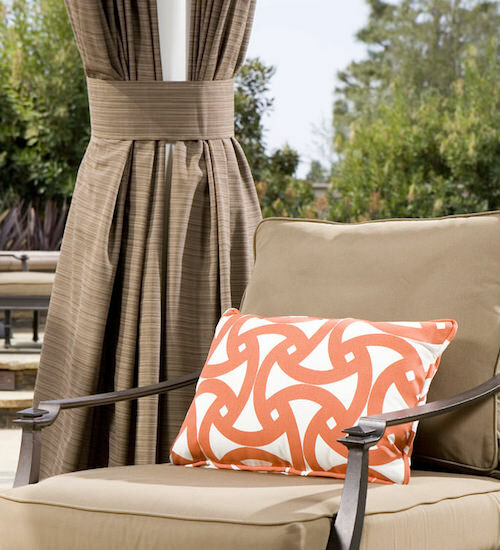 DrapeStyle's outdoor drapes and curtains are made with genuine heavyweight, weather resistant, yarn-dyed Sunbrella fabrics. They feature bottom weights and weather resistant bonded polyester threads. Choose from six pleat styles complemented by solid brass, corrosion resistant grommets. Kravet has been making some of the finest couture fabrics since 1918. With a reputation for distinctive style and quality Kravet has been able to partner with many of the most sought after designers like Lee Jofa, Barbara Barry, Candice Olson, Thom Filicia and Windsor Smith to name a few. We've spent years looking for the finest, softest linen we could find. We found it. Our Belgian Estate Linen is simply the best linen we've seen for making the most luxurious linen drapes and curtains available. Upgrade any of our draperies with blackout lining for only $99 each panel! These are the original striped silk drapes that DrapeStyle has been selling online for over 15 years. We start with the highest quality imported Indian silk and make each drapery panel to order in our own Arizona workroom. You select your pleat style, length, width and lining option and our team of talented seamstresses will make your silk curtains exactly how you want them. We have been making our custom Roman shades alongside our custom curtains and drapes with consistency and quality, since 2002. 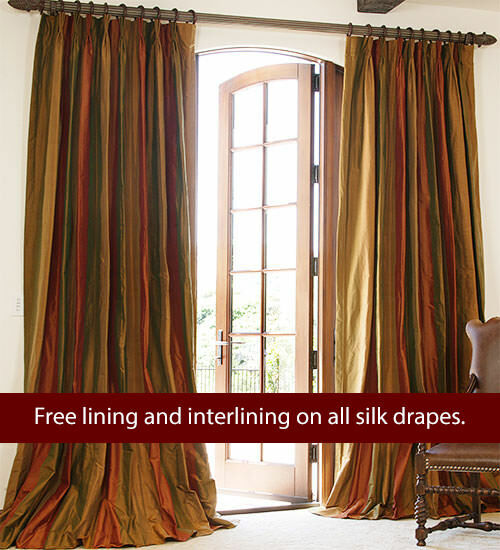 Whether you are looking for traditional curtains or contemporary Roman shades we offer over 500 fabrics to choose from. And, of course, expert advice is only a phone call away 800.760.8257. 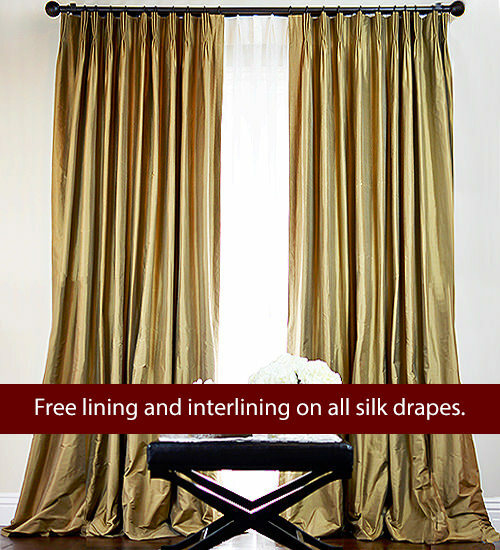 Select any two of our silk fabrics and let us make you these beautiful double bordered silk drapes. We have over 40 colors of Dupioni Silk to choose from. The DrapeStyle way of making luxury custom drapes, curtains and Roman shades takes a little more time, costs a little more money but we think it's worth it.